When the humidity level reaches sky high limits, I’m talking 90% humidity during the summer months, my hair becomes a mass of frizz! This post contains some affiliate links for your convenience, read the full disclosure policy. The summer is quite possibly the most notorious season for bad hair days! While summer hair is, unfortunately, nothing to brag about for many of us. There are luckily a few things that can help. For example, washing your hair less can actually help your natural hair oils to do their job. But, those oils often build upon our scalp and roots. This is where a good natural boar hair brush comes in to help distribute the excess oil down the length of your hair. 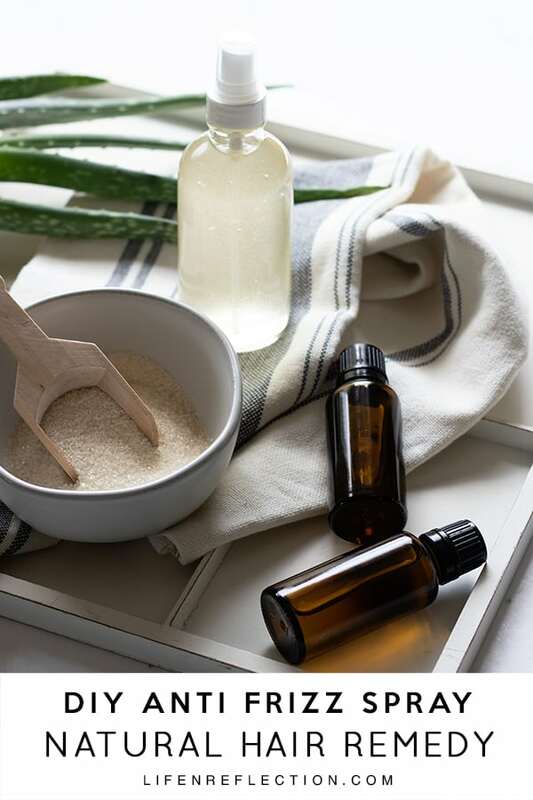 Secondly, if your hair tends to tangle a good homemade hair detangler will not only stop the tangles it will leave hair softer and healthier than before. Give it a try and use my five steps to keep your tresses moisturized, strong, and tangle free here! Third, a moisture rich conditioner like my recipe for an all natural shea butter conditioner does make big difference when it comes to frizzy hair days. But, sometimes washing your hair less often, using a dry shampoo, detangler, and great conditioner is not enough! What Worked to Tame Frizzy Hair? Honestly, all of the above works to cut down on frizzy hair. However… most are not easily applied. Most require a hair mask or hot oil treatment. Although, I can make time for one of those once a week, I need something more convenient. And I imagine, so do you. 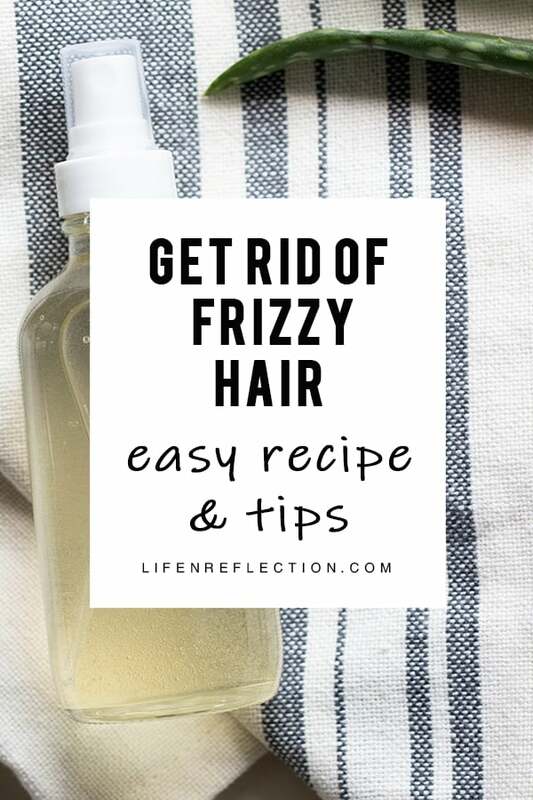 Luckily for us, I combined several of the frizz controlling ingredients into an easy, very convenient DIY anti frizz spray! Now we can tame our frizzy hair in little to no time. After regularly washing your hair, pat dry with a towel, and apply a detangler. Comb through hair and apply a DIY anti frizz spray from the following recipe. Style as usual and spritz in more as needed, depending on if you have curly, straight, or wavy hair. Utilize aloe vera gels’ ability to form a protective layer around hair to prevent moisture loss. Along with its’ power to smooth hair and keep the frizz down. If you’re washing your hair every other day, refresh it by lightly wetting with a spray bottle and applying more anti frizz spray. In a small dish dissolve two tablespoons of sugar into a half cup warm water. Stir well to quickly dissolve sugar, then allow to cool. Speed up the process by placing the sugar water in the fridge for three minutes. Next, once cooled add a third cup aloe vera gel and half a teaspoon apricot oil. Stir well to combine. 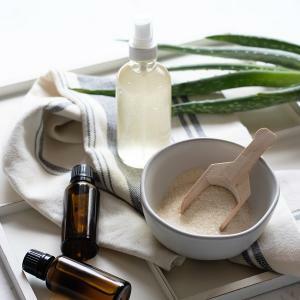 While stirring add five drops each of lavender and rosemary essential oil. 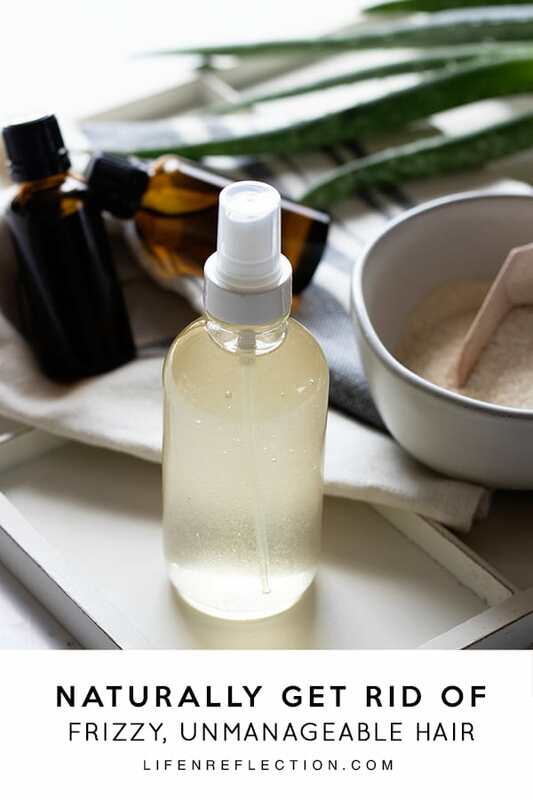 Using a funnel pour mixture into an eight-ounce spray bottle (like this one). Remove the funnel and place the nozzle on the bottle for use. 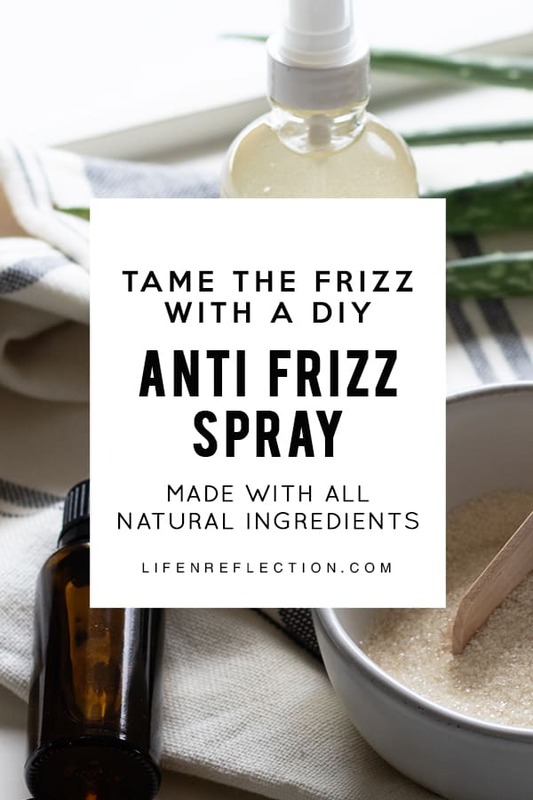 This DIY anti frizz spray can be applied to dry or damp hair. Which means you can use it on the days you skip shampooing in combination with a dry shampoo. And you can apply it after brushing to tame frizz and before or after blow drying. Tame your frizzy hair with a DIY anti frizz spray you can make in minutes! It is the quickest solution to overcoming the effect humidity has on your hair. This is great I really like it for my hair, that is thin ..this recipe works nicely ..thank you Kristy!! Thanks Debbie, I a few days a week too.